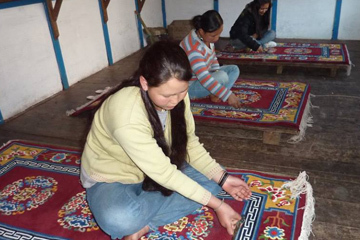 DCF also sponsors young adults, who do not desire a formal college education, to learn skills such as computer programming, hotel management, carpentry, creating and marketing traditional clothing, Thangka painting and other arts to sell to local institutions. Many young Tibetans who escape from Tibet risk their lives crossing the Himalayan Mountains in search of a better life and education in India and Nepal. After arriving, many find employment difficulties due to a lack of education. The Delek Children’s Foundation feels it is our responsibility to ensure that these young adults do not become a lost generation. They deserve the opportunity for training and the ability to be contributing members of their society.